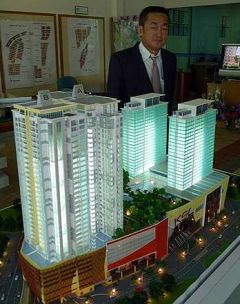 Ku Hwa Seng posing with a model of KSL City, which includes two hotel blocks and two 33- storey apartment blocks. JOHOR BARU: KSL Holdings Bhd will be opening part of its KSL City project development the four-storey retail complex on Dec 12. Executive director Ku Hwa Seng said the retail complex would be Johor's largest shopping mall with a gross floor area of 880,000 sq ft and 2,800 indoor parking lots. He said the podium block had 420 retail shops, 50 food and beverage outlets, and eight cineplexes, including two 3D screens. Ku said the atrium of the retail complex would also house Johor's largest indoor electronic billboard made up of nine 62-inch flat-screen LCD televisions. Work on other components of the project is progressing well and they are expected to be ready by the end of next year, he said in an interview with StarBiz. Dubbed one of the biggest commercial complexes in the southern region, the RM500mil KSL City project also houses hotel and apartment blocks. The project is also the first such development in Johor that combines retail, hospitality and high-rise residential living, similar to those found in Kuala Lumpur and Singapore. The 1,000-room KSL Resorts Hotel comprises two 20-storey blocks while D'Esplanade Residence @ KSL City offers 346 units two 33-storey apartments blocks. Glass Tower I and II offer 242 and 104 units respectively with built-up areas ranging from 93.83 to 929.03 sq m that are priced from RM500,000 each. Our apartments have attracted Malaysians as well as buyers from Hong Kong and Singapore. With the influx of foreign investors to Iskandar Malaysia, we believe they will also snap up our units, said Ku. He said the project's location in Century Gardens less than 3km from the Johor Baru city centre and the Johor Baru Customs, Immigration and Quarantine complex in Bukit Chagar would be a strong selling point to buyers. Ku said KSL was confident that the hotel would do well, considering most hotels in the Johor Baru central business district were recording almost 90% occupancy rate. He said Johor also benefited from Singapore's Sentosa World Resorts and Marina Sands Resorts as Malaysians planning to visit the resorts would probably stay in Johor Baru as the hotel rates in the republic were too costly for the average visitor. Presently, Singapore is facing a shortage of hotel rooms and the average room rates of S$300 could further increase to S$500 by the time KSL Hotel is completed. We are planning to have a tie-up with the two Singapore casino operators to provide shuttle bus services from KSL City to the two resorts, said Ku.